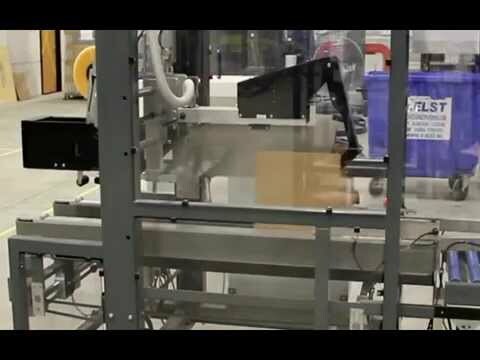 Automatic sealing of corrugated cases can speed up your production process. You can seal with tape or, in case your quantities justify the investment, select hot melt for lower material costs. Lantech case sealers are equipped for either hot melt and tape sealing. Outfit your case sealer with tape sealing technology to reduce the initial cost of acquisition. Select hot melt, on the other hand, to take advantage of lower materials cost and the advantage of hot melt supply replenishment without stopping the machine. Lantech let’s you select the best sealer depending on case size, required flexibility, required speed and sealing preference. The sealers auto adjust for case width variations. Cases are handled with the utmost care. The sealers feature a two-stage front flap folding system to ensure a positive closure. The system ensures a precise folding of the rear flap. The tops of the cases will be flat and easy to stack. Lantech sealers can easily handle different case qualities.